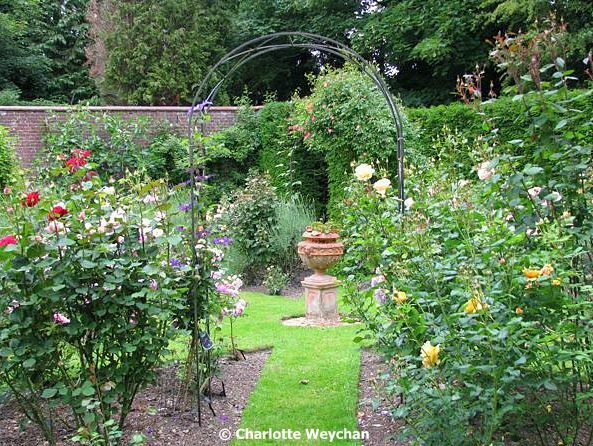 Enjoy the heady scent of British roses ... and two new rose gardens! Roses are in bloom all over Britain! And what better chance to get out and visit rose gardens than over the Bank Holiday weekend, before the petals begin to drop, after this long spell of dry weather? This wonderful, scented flower has a long and colourful history and fossil evidence indicates that they are over 35 million years old. The cultivation of roses in gardens seems to date back 5,000 years to ancient China, where roses are depicted in early wall frescoes. You'll find many gardens participating in the National Gardens Scheme that have magnificent roses, but the property that gets my vote for spectacular blooms is Town Place in Sussex (top), where the roses are so abundant and dazzling, they'll take your breath away. It's a stunning garden and opens for six days during June and July for the NGS, so if you get a chance, do visit. This years dates are 12, 16, 23 and 26 June, and 3,10 July, between 14.00 and 18.00. Visitors are also welcome by appointment. National Trust properties that boast spectacular rose displays include Mottisfont Abbey in Hampshire which draws visitors from all over the world with its wonderful collection of old-fashioned roses, planted by world-class rosarian, Graham Stuart Thomas, in the 1970's; Nyman's Garden in West Sussex and Polesden Lacey in Surrey. I'm sure there are many others, but these are the three I've seen this month. 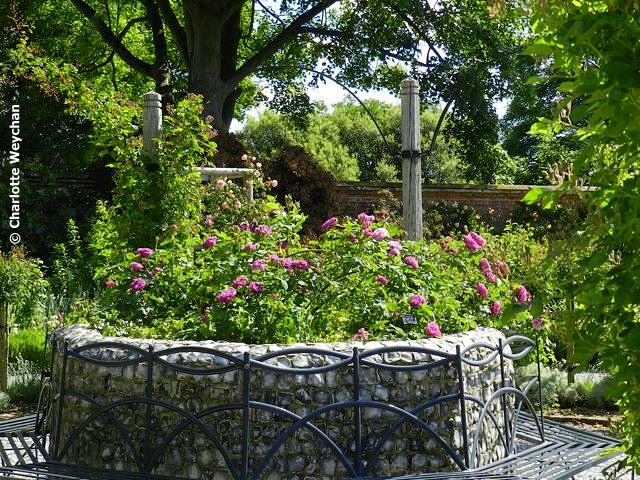 St Mary's House at Bramber in West Sussex has a charming rose garden, planted in 2002 to commemorate the Queen's Silver Jubilee, which is being added to every year. 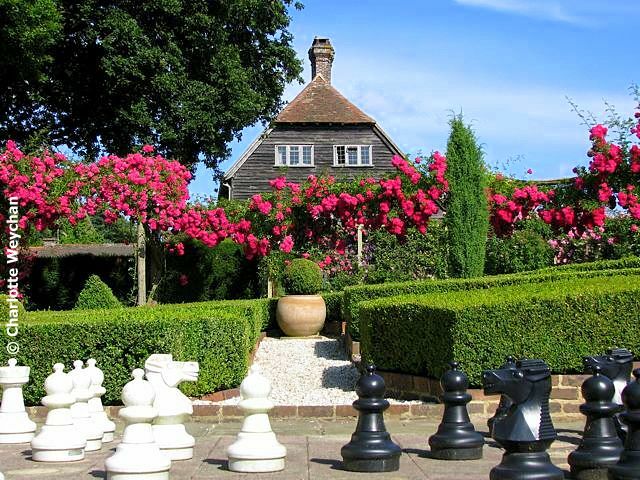 This is a really lovely and little-known garden surrounding an immaculately restored Elizabethan house. Open on Thursdays and Saturdays throughout the summer months, this garden is definitely one to watch as work progresses. 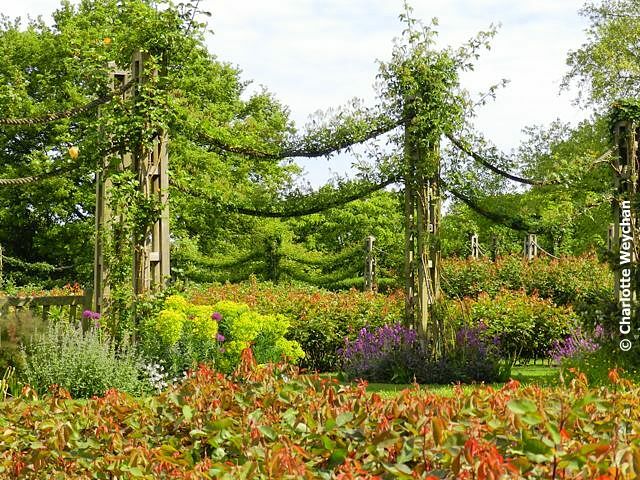 Londoners can visit Queen Mary's Rose Garden in Regent's Park to get their fill of roses. It was too early for me to see them when I was there in early May, but I was stunned by the layout of this garden and can just imagine how fantastic the roses are when in bloom! I'm going to try and get to see them next week, but just in case I don't, do go and visit for yourselves and see how they're looking as the dry spell continues. 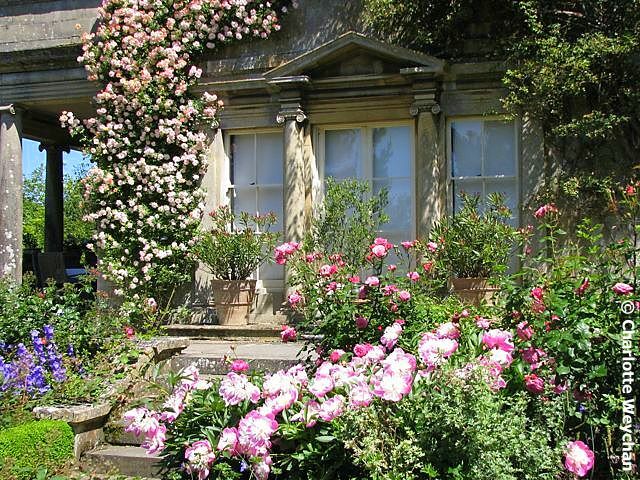 Kiftsgate Court in Gloucestershire is glorious to visit at any time during the summer months (and of course, you've got Hidcote right next door), and you'll be bowled over by the scent of the roses here on a hot day. 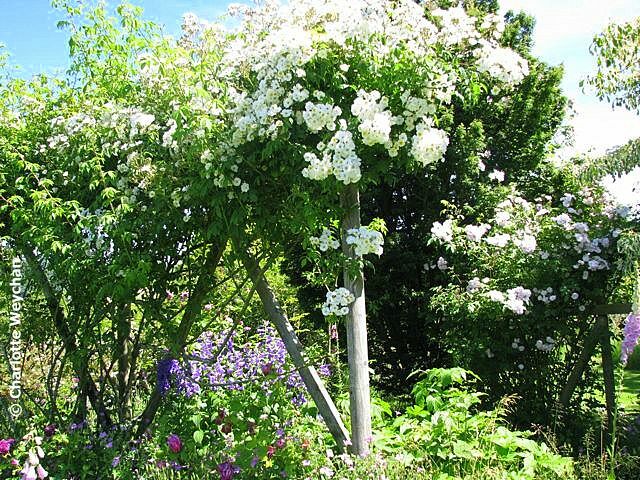 You'll find the famous 'Kiftsgate' rose (Rosa filipes 'Kiftsgate') in bloom right now - an amazing sight - although garden owner Anne Chambers likens it to a triffid if kept unchecked! And if you want to see more old-fashioned roses, make a pilgrimage through the country lanes of Gloucestershire to Hunt's Court near Dursley (below). This has spectacular rose displays at this time of year! 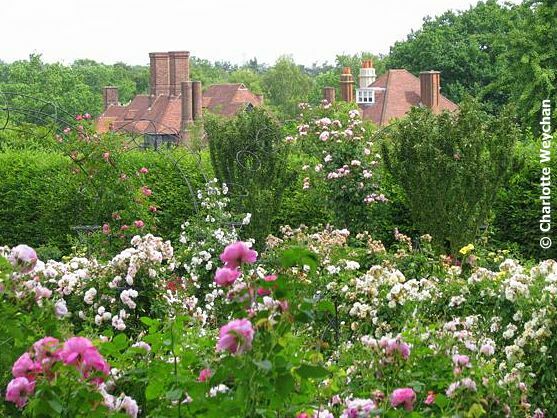 And two other spectacular British rose gardens that shouldn't be missed are the new Bowes-Lyon rose garden at RHS Wisley (below), designed by Robert Myers. It features more than 4,000 roses alongside herbaceous plants, with 150 different types on offer ranging from old-fashioned roses through to modern cultivars. Also new is the rose garden at Savill Gardens, with its futuristic viewing platform, which allows you to view the roses from above. Wonderful photos and roses! I love St Mary's House. When are we going to get together to go garden visiting? I love roses and these photos were just wonderful. Ah, roses! The scent must be fabulous! Great inspiration - this makes me dream of what I could do in my garden! It certainly looks like a good year for roses in the UK. I can almost smell them. One photo better than the next. 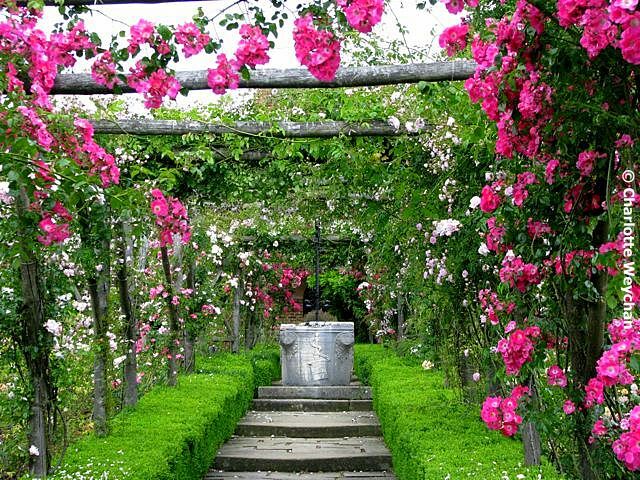 Beautiful gardens and delicious roses. These gardens are definitely amazing, Charlotte. The sheer number of blooms and the colors standing out against the leaves, really amazing. Lovely post Charlotte, lots of work, but I know you enjoy it! I'm going to visit the Savill and Wisley rose gardens in a couple of weeks for my 40th birthday treat! Thought I'd squeeze in Titsey Place as I haven't been there either.